In CES2019,these products involved basic necessities field will change your life! From January 8th to 11th, 2019, the annual CES2019 has kicked off in Las Vegas. This year, 4,500 companies from 155 countries participated in the exhibition, including 1,012 exhibitors from China, accounting for 1/4 of the total number of exhibitors, which is the second largest exhibitor group after the United States. 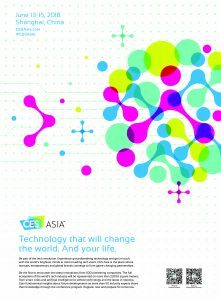 CES is the largest and most influential consumer electronics technology exhibition which began in 1967 in the world. It is also the trend indicator in the field of electronic technology. It has led the development and trend of the technology industry in the coming year, attracting many manufacturers and consumer participation. As a trend indicator for consumer electronics. What kind of future life will this CES show us this year? Various wearable devices remain the highlight of this year’s CES. For example, Suning exhibited the Magic runway fitting mirror service. You only need to select the gender and clothing category in front of the mirror. Then you can see the effect of putting on the clothing. You can try on nearly 50 new clothes in one minute. Another example is Jingdong’s AR (Augmented Reality) makeup mirror, which allows users to repeatedly apply cosmetics. The virtual effect of AR can restore the effect of lipstick, blush, eyebrow pencil and contact lens on the user’s face. In addition, E-Vone’s smart shoes, the smart technology inside can determine whether the wearer falls, once this situation is discovered, the emergency contact will be notified immediately, especially for the elderly people,outdoor users. Future diets may also be transformed by technology. It is reported that the automatic toaster displayed at CES will be put on the market later this year. It can choose and automatically control the temperature according to the taste of the customer like a vending machine, and bake out the personal bread that belongs to you. General Electric has integrated a smart countertop system in the induction cooker to help the kitchen novice to accurately control the temperature and promptly send reminders according to the cooking process. Even if you are a kitchen rookie, you can also burn a pot of fragrant products. In modern life, living is not just a place to live, but also includes the concept of smart home. At this CES show, Hisense’s three-color laser TV, LG’s reel TV, Samsung’s 98-inch large TV… a piece of screen like a flower. It is particularly noteworthy that the latest 8K resolution display technology has been reloaded and is bound to become the main force of smart homes in the future. A larger screen and a clearer picture will give a new look to the home. In addition, most of these TVs are equipped with artificial intelligence voice assistants, as long as you speak your instructions to achieve interaction. As an important part of future life and an important trend of smart home, in addition to television, furniture robots, mattresses and pianos all have artificial intelligence technology. In terms of technology trends, 5G applications are attracting attention. In the 5G era of the Internet of Everything, the future travel is very different. At this year’s CES show, chip giant Qualcomm released the third-generation car chip for the autopilot system, which is based on the Snapdragon 820A platform, supporting Qualcomm artificial intelligence engine AI Engine, signal processor, CPU and GPU, using Qualcomm Hexagon processing Device. Qualcomm also upgraded V2V technology to C-V2X technology, which uses Qualcomm’s 9150 C-V2X chipset. In 2022, Ford will be the first to apply C-V2X technology to US models. At the same time, Baidu’s Apollo intelligent driving system version 3.5 was officially released. The latest version can make driverless drivers smarter and more powerful. It can realize the unmanned technology of complex urban roads including downtown and residential scenes. Multiple autopilot application scenarios. It is foreseeable that in the new year, the competition focused on the battlefield of technology will become more and more cruel,.Better abundant reserves and industrial chain and forward-looking layout will occupy the upper hand. However these profound technological accumulations and in-depth market layout are bound to bring profound changes to future life. Previous story My goodness!8K TV amazed me a lot!